Coming off a sixth place finish at Road America a few weeks ago, in only his third race weekend in the Cooper Tires USF2000 Series Powered by Mazda, Michael d'Orlando continued to show his potential at Mid-Ohio Sports Car Course in Lexington, Ohio for the official test of the Mazda Road to Indy (MRTI) driver development program. Showing strong results, including a 4th and 2nd fastest lap time in two of the practice sessions, the 16-year-old Hartsdale, NY native will now shift his focus to the upcoming race weekend at the same venue. 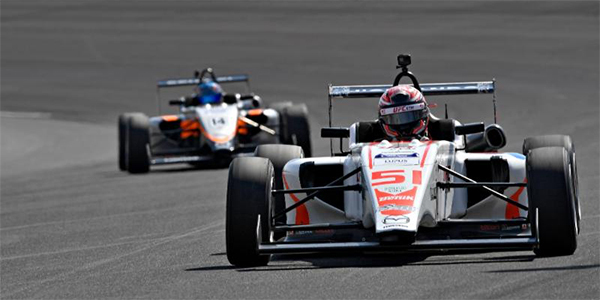 After Road America's sixth place performance, d'Orlando kept his training on the side-lines with partners including UFC Gym in Mamaroneck, NY, in lieu of competing in Rounds 8 & 9 of the MRTI, at the Streets of Toronto Grand Prix. But he was back on track last week for the official series test at Mid-Ohio, where he continued to prove that he and his Team Benik race team have the speed and potential for top results. The official test consisted of two days, with six on-track sessions, and d'Orlando wasted very little time getting up to speed. By the end of Day 1, d'Orlando laid down the 7th fastest lap of the final session. Starting off strong on Day 2, d'Orlando clocked the 4th fastest lap time in the first session, ran a race simulation in the second session, and then proceeded to lay down the 2nd fastest lap time in the third and final session of the day. When the dust settled, the young rookie's performance placed him firmly in the front end of the field with the 5th fastest overall lap time of the two day event. Michael d'Orlando and his team at Benik will now head back to Mid-Ohio this weekend for the 10th, 11th and 12th rounds of the Cooper Tires USF2000 Series Powered by Mazda, looking to carry the momentum of his Road America performance and capitalize on the successful test at Mid-Ohio. For more information on Michael d’Orlando, and for opportunities to be a part of the development of this young talent, contact d’Orlando Racing at info@dorlandoracing.com or Rickard Franchini of Italsport at italsport@live.se. Follow Michael on social media at Instagram (dorlandoracing), Facebook (Michael d’Orlando Racing) and Twitter (dorlandoracing).